While the church does food drives three times a year, FeedFest is a project on a much greater scale. The goal is to collect 1,200 pounds of food. In addition, “Byram Township operates a food bank that distributes Shop Rite/Grocery Store gift cards to the community. The goal of Feedfest is to raise $1,000.00 for [that] program,” said the Rev. Tim Nicinski, pastor of the church. This is the second year for the program which was inspired by a program a friend told Nicinski about: FoodStock. Nicinski noted that even in this economy, “the need is still great.” He shared that by getting food at a pantry, it helps those struggling to use their money to pay other bills. It can help working class people and those who are residentially fragile: going from homelessness to a residential setting, to permanent housing. 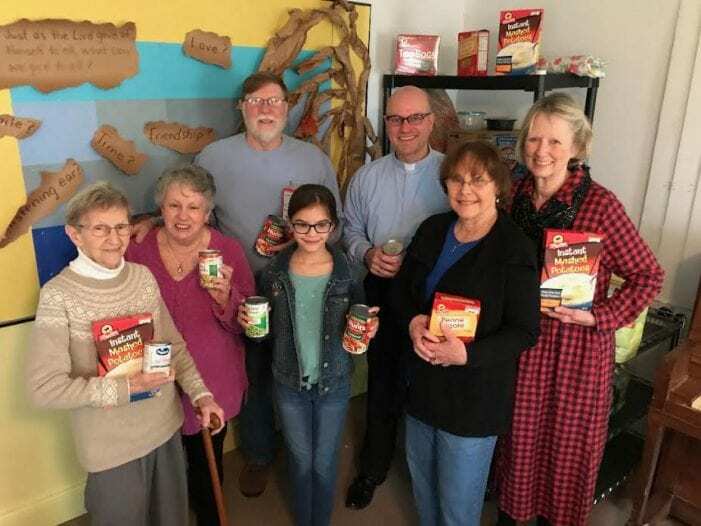 Nicinski shared that the organizations that will get the food include Norwescap, a food depot in Phillipsburg, which supplies pantries in Warren, Sussex, and Morris counties. Also, receiving food from FeedFest will be Project Self-Sufficiency in Newton. When asked about the types of items needed, Nicinski shared that they are non-perishable items. “Items that are in most demand are pop-top items including canned meats, fruits, vegetables, and meals as well as cereal, pasta, rice, crackers, dry milk, paper goods (such as toilet paper) , and personal products ( laundry detergent, soap, tooth paste),” he said. Items can be brought in by groups (like scouts), organizations, or individuals. “We try to make it a fun day for the community,” shared Nicinski. That “community” can be far-reaching as Nicinski noted that last year, people from a variety of areas brought in food. FeedFest is held in the JAM catering hall adjacent to the church. As people arrive with what they’ve collected, a bell will be rung and the food weighed and the weight recorded. Local businesses, such as Shoprite, an area pizzeria, Stonewood Tavern, Salt, Rose’s, and Kula Yoga have provided the prizes for the heaviest donations brought in. In addition, there will be refreshments, such as pizza and water, a DJ, a clown, balloon animals, games, and a Valentine’s Day craft for all ages. Nicinski noted that his church will deliver what’s collected at Feedfest to the benefiting organizations. “Everybody is welcomed,” said Nicinski. For more information on Feedfest, contact pastor Tim Nicinski at pastortimwumc@msn.com.